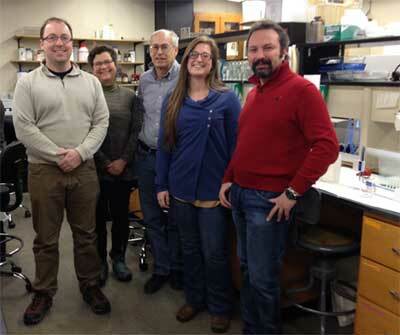 The Montana State University WheatCAP group. Participants include (left to right): Jason Cook, Jamie Sherman, Luther Talbert, Brittney Brewer (graduate student), and Hikmet Budak. Graduate student Brittney Brewer will work with Luther Talbert, Hikmet Budak, Jason Cook, and Jamie Sherman to verify, clone and deploy a QTL for productive tiller number on chromosome 6B (approximate position 30 MB). This QTL, designated QTn.mst-6B, explained ~10% of the variation in productive tiller number (LOD >5) in three RIL populations (Naruoka et al., 2011). The favorable allele is present in only 7 out of the 220 elite lines from North America in a Spring Wheat AM panel. In order to identify NIL for contrasting alleles, heterozygous F5 individuals from three populations were selected, and F6 progeny were screened to identify homozygotes. Field experiments using these NIL confirmed that the favorable allele is associated with high initial tiller formation. However, these early tillers matured into productive tillers only in high-moisture environments, contributing to environmental plasticity (Nasseer et al., 2016). Heterozygous lines from the HIFs will be used to generate F6:2 populations for fine-mapping, identification of recombinants and cloning of the causal gene. Effect of alleles at QTn.mst-6B on productive tiller number. 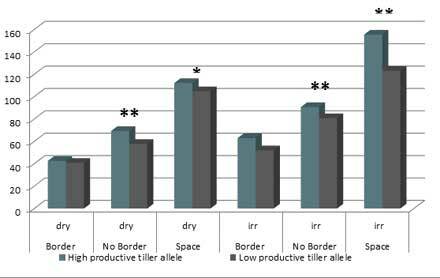 NIL for alleles at the tiller QTL QTn.mst-6B were included in yield trials as bordered rows (high competition), non-bordered rows (intermediate competition), and as space plants (low competition). Results were that the high number of early tillers caused by the favorable allele at QTn.mst-6B resulted in a high number of productive tillers only under favorable conditions. Thus, this allele provides plasticity to spring wheat development. Dr. Jason Cook with assistance from Jamie Sherman will also spearhead the national effort to provide training opportunities for all of the graduate students enjoying research opportunities on the national project.